Gift tags can be quick to make and add a personal touch to any gift. 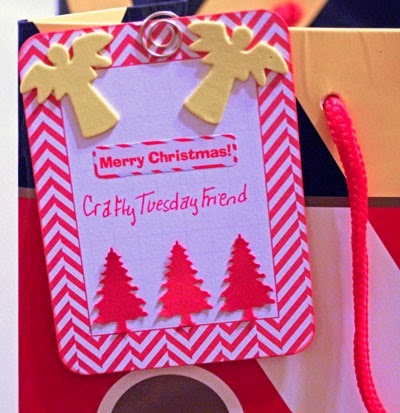 Ever since I created a FUN gift tag back in June, I've enjoyed adding handmade tags to a variety of gifts. I know many of you will be wrapping gifts during this holiday season, so I thought I'd share some of the tags I've created with my abundance of scrapping supplies. I created this first tag with a few paper scraps, a strip of glitter ribbon, and some small embellishments, then added it to a festive box with a piece of ribbon. 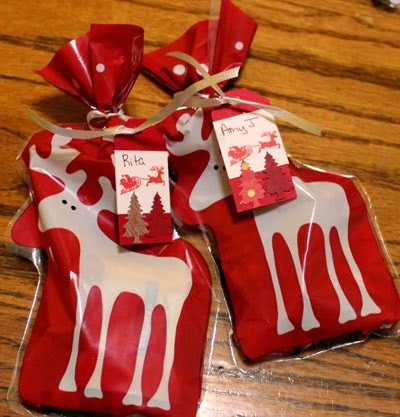 I had FUN using paper scraps, punched trees, a Santa stamp, and a star hole punch to create these tags . . .
. . . which I then tied to treat bags with a ribbon. I'm also enjoying using 3x4 cards as the base for gift tags. I simply add a few embellishments and a sticker or stamped sentiment to complete it. A shaped (or regular) paper clip works perfectly to hold the tag on a gift bag. 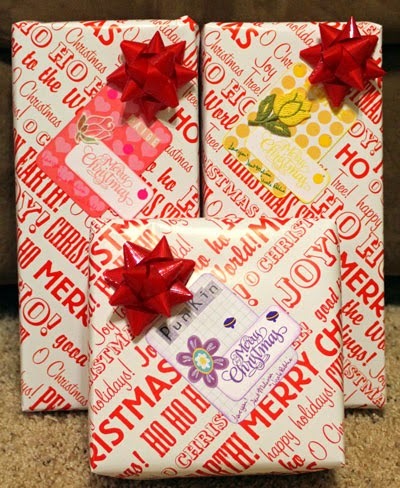 For my nieces' Christmas gifts, I created tags in each of their favorite colors. Each tag had a 3x4 card base, a stamped sentiment, a flower embellishment, and the recipient's name in letter stickers. They were thrilled with the personalized tags despite the fact that they really didn't match the Christmas wrapping at all! 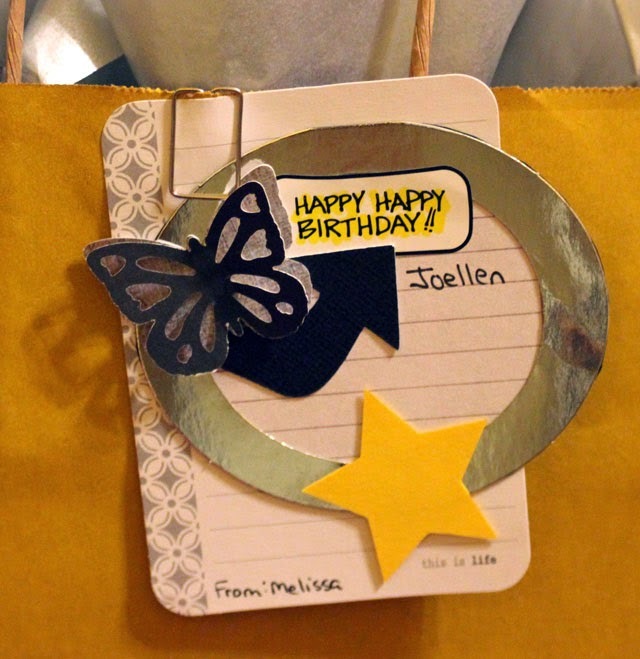 And here's a tag I made for a birthday gift with a rectangular paper clip holding it to the gift bag. 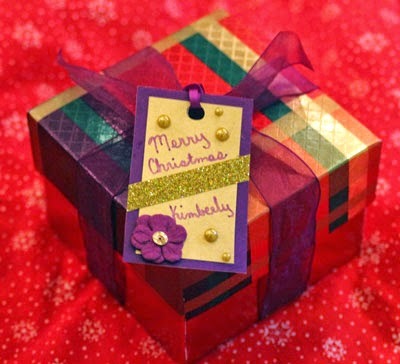 Will you be adding handmade gift tags to your presents this holiday season? They're great! I make almost all my gift tags. I was pleasantly surprised to find that my family saved many of the ones I made last year, so I'll be able to use them again! I make almost all of our gift tags - I like to do that with the scraps from Christmas cards and leftover Christmas embellishments. I've reused some but usually we add notes so that doesn't make sense.